Elsewhere, however, something is definitely lacking. The brief Inner Ear Rapture combines the cello effect with crashing feedback to little end, acting as a kind of intro to Baby Won't You Weird Me Out, which brings some lovely catchy riffage to the table before devolving into a jazzy jam that ends with a whimper rather than a bang. Worm Farm Waltz is like early Clutch at first with a southern-tinged snarl taking form in the verses, again changing into something odder as the track progresses. A Growing Disgust is one of the more typical tracks, if one of the better ones, a sliding, enveloping riff carrying all before it. Two-minuters like Leon Vs The Revolution and Holy Barbarian, veering between a focus on riffs and atmosphere respectively, do little to stay with you. Oddball Wings cover Let Me Roll It has a nice riff and vocal play but drags a little despite it, and closing nine-minuter Tommy Goes Berserk is oddly dreamy, creepy at first but doing little to foster that atmosphere successfully, building up into something more upbeat before falling into a pit of ambient noises - enjoyable for what it is, but hardly revelationary. 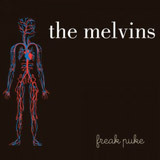 Those used to Melvins albums will eat this up (as if genuine fans of the band even need reviews such as this one!) yet it's getting harder to explain the unique appeal of this cult band; certainly, Freak Puke is not the classic, genius release that I'd like to see from them. It is, instead, more of the same - in style if not quite in practise. For once, that's not a genuinely bad thing, but it does impress upon me the fact that those who collect all Melvins albums have more than a little of the obsessive about them.